It has to be said, I do miss the tennis mania of the first few days. When there’s so much to see, the adrenaline really gets you through the day. The reduced schedule also means there is more pressure for each match to deliver the goods because you can spend the whole day building up to one specific match. It felt a bit like that today, with all eyes on the Serena vs Halep blockbuster. And it felt like that yesterday too, with Tsitsipas vs Federer the focus of attention. Fortunately, both matches lived up to the hype – nothing upsets the natural order of the tennis universe quite like Federer losing, and Serena vs Halep would have been a very worthy final. Tomorrow, it will be the thought of Barty vs Kvitova that keeps us energised throughout the day. This new dynamic to the event will inevitably have an influence on the podcast. In order to avoid more very late nights – it was past 2am by the time we started recording and close to 3am by the time we finished yesterday – it’s likely that we will start doing some two-parters, covering the day session in part one, and then finishing off with a recap of the night session. There should also be the possibility of getting some guests. As for the blog, well, that may also take on a different form. I’m not quite sure yet. I’ve got some content ideas for the next couple of days, but we’ll see how it goes. It can’t be said enough: Naomi Osaka is having a really brilliant tournament. After surviving the madness of Hsieh Su-Wei, she dealt with Sevastova’s craft to reach the last eight. In both matches she recovered from dropping the opening set. That’s significant because she’s now already won more matches from a set down in 2019 than she did in the whole of 2018. What’s more, she’s doing such a fine job of backing up her US Open victory. Of the recent first-time Grand Slam winners, only Jelena Ostapenko matched her by reaching the quarter-final at her next Grand Slam tournament. 2018 US Open —> Aus Open 2019? 2018 RG —> Wimbledon 2018? 2018 Aus Open —> RG 2018? 2017 US Open —> Aus Open 2018? 2017 RG —> Wimbledon 2017? 2016 Aus Open —> RG 2016? 2016 RG —> Wimbledon 2016? One of the most telling quotes of last year came from Borna Coric at the Davis Cup final. Speaking about his thigh injury, he said: “It’s painful, but it’s not a problem.” This seemed like an oxymoron, but it’s the life of a tennis player, particularly in the context of Andy Murray’s recent announcement. Coric echoed the sentiment to me the other day, saying that he is still managing the injury, but that it still isn’t affecting his matches. He had expected it to heal over the off-season, but because he was only able to take a couple of weeks off following the Davis Cup final, it didn’t. Anyway, Coric lost unexpectedly to Lucas Pouille today, and you have to believe him when he says that his injury wasn’t a factor. Curiously, it was a match between two players who, prior to this week, had a combined 0-9 lifetime record at the Australian Open. For Coric, the wait for a first Grand Slam quarter-final goes on. For Pouille, he’s back at that stage for the first time since 2016. 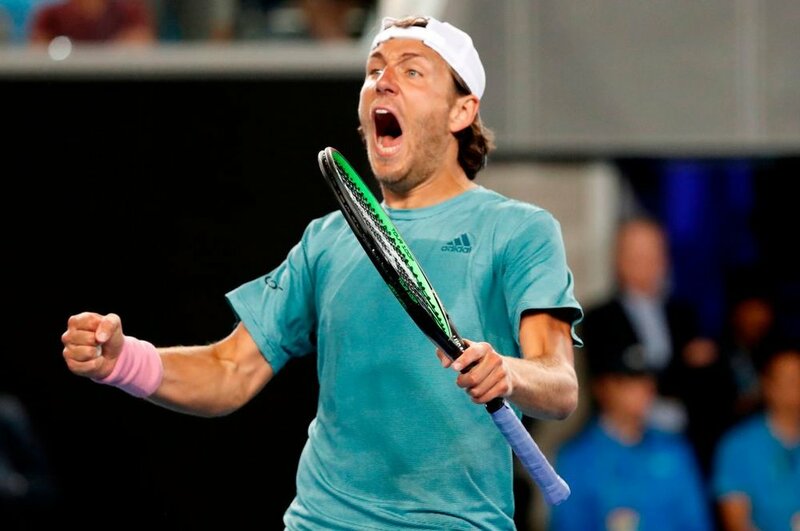 Last year Pouille was the ultimate “all or nothing” player. He reached a few finals at the start of the year, but also suffered a load of first or second round defeats. His inability to get stuck into tournaments was mirrored by his inability to stick around in matches – two thirds of his losses came in straight sets. He was an unforced error machine at times. His game lacked variety. Enter Amelie Mauresmo. It can be easy to jump to conclusions about the impact of a coach, but the way in which Pouille varied his game against Coric had Mauresmo’s influence all over it. Federer vs Tsitsipas last night was really good, apparently. I can neither confirm nor deny because I was busy trying to decipher the match notes of the journalist next to me. I don’t remember there being a single moment this Australian Open when one of Roberto Bautista Agut or Kei Nishikori weren’t playing. It’s like they’ve had some kind of bet over who can spend longer on court. On alternative days they seem to be trying to outdo each other. So far, RBA is edging it. He’s been out there for 14h 03m, Nishikori for 13h 47m. Remember why I picked Viktoria Kuzmova to reach the quarter-finals? Because the last 19 Grand Slams have all featured an unseeded player in the quarter-finals. With Danielle Collins and Anastasia Pavlyuchenkova in the quarters, make that 20. Out of the 26 Australian Open men’s winners, how many are left-handed and how many are right-handed? Answer in a tweet, please.